Left: William Edward Forster by Henry Richard Hope-Pinker, 1850-1927 (Presumed). 1890. Bronze. Victoria Embankment, London. [Another view] Wikipedia states rather too laconically that “William Edward Forster PC, FRS (11 July 1818-6 April 1886) was a British industrialist, philanthropist and Liberal Party statesman.” Forster in fact was one of those Victorian giants who began his career in the woolen industry working twelve hours a day while studying Greek, mathematics, and political history at night. After founding a company in the textile trade, he devoted himself to liberal causes, early entering Parliament and remaining there for the rest of his life, almost always winning his seat by landslide votes. As a young man he accompanied his Quaker father to Ireland where they distributed famine relief at a time when many in the British government denied any major problem existed. 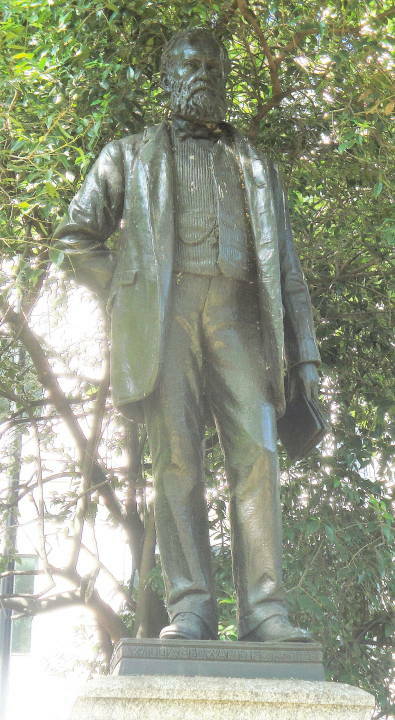 After election to Parliament, he quickly became a major force in opposing recognition of the Confederacy during the American civil war, advocating extension of the right to vote resulting in the Reform Bill of 1867, and fair treatment of Ireland and the Irish poor. the Endowed Schools Bill through the House of Commons. This was a bill which raised no great parliamentary issues, but its importance may be shown from the fact that it dealt with three thousand schools with a gross income of 592,000£. He had also to conduct the preparation of measures against the cattle plague. He was meanwhile carefully considering the measure for providing a national system of elementary education. Various bodies throughout the country concentrated themselves into two, the National Education Union and the League, which met at Birmingham. The Union ostensibly advocated the spread of the voluntary school system, and the League the provision of schools at the cost and under the control of the public authorities. In reality, however, the desire of the Union was to guard the interests of certain dominant religious bodies, especially that of the church of England, and the desire of the League was to secure a fair field for the dissenters. Forster endeavoured to steer an even course between these two opposing theories, adopting a plan which he traced originally to Mr. Lowe. Places where additional school accommodation was required were to be discovered and the accommodation supplied through the agency of a newly constituted public authority. 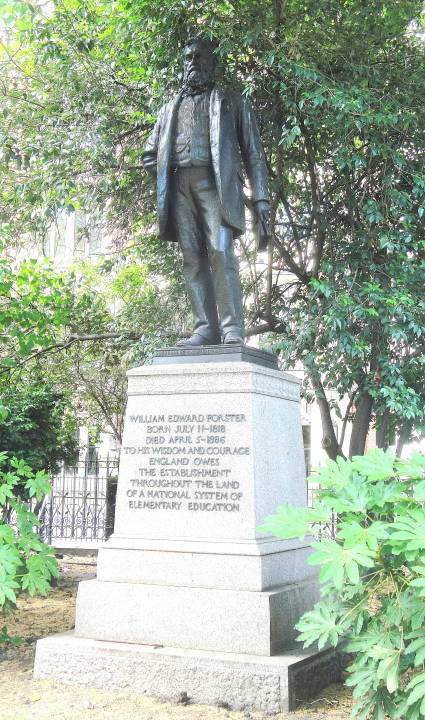 In the third week of February 1870 Forster introduced his Elementary Education Bill. His speech, long and full of detail, was at the same time very careful in form, well arranged, abounding in evidence of a thorough study of the question, conciliatory, and warmed by enthusiasm for the cause of education. He pointed out the great deficiencies of the existing schools, and declined to adopt either the continental method of state education or the opposite policy of increasing the bonus upon voluntary schools. He therefore proposed to create an entirely new local authority called the School Board. The board was to have the power of providing necessary school accommodation, and of directing its own schools, subject to the ultimate control of the education department. At first Forster proposed that school boards should be chosen by popular election in London, and elsewhere by town councils and vestries, but he soon adopted direct popular election in all cases. Thus far all parties were ready to accept Forster's proposals; but the jealousy between the church and dissenters soon produced discord. The Birmingham League settled down upon the religious shortcomings of the measure, and around these there speedily arose a controversy which, by the time of the debate on the second reading, 14 March, had assumed the most threatening proportions. An amendment was moved to the second reading by Mr. George Dixon, liberal member for Birmingham and chairman of the Education League, to the effect 'that no measure of the education of the people could afford permanent satisfactory settlement which left the important question of religious instruction to be determined by the local authorities.' In the end the amendment was withdrawn, and three months later the government accepted the amendment of Mr. Cowper Temple, the effect of which would be 'to exclude from all rate-aided schools every catechism and formulary distinctive of denominational creed, and to sever altogether the connection between the local school board and the denominational schools, leaving the latter to look wholly to the central grant for help.' As a consequence of this, the share of the total cost of education payable by the central department the grant as distinct from the education rate which had been originally fixed at one third, was raised to one half, and on this basis the question was settled. The bill passed without much further difficulty, although not without having to undergo much invective both from extreme churchmen and from the nonconformists and their allies. The principle of compulsion was not as yet admitted. 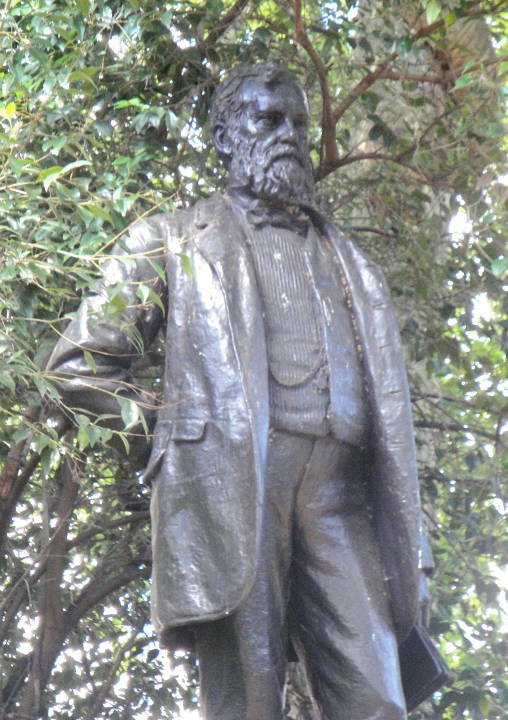 Forster struggled hard in 1873 to carry a compulsory act, sufficient school accommodation having in his opinion been provided for an effectual application of the principle; but though he at first won the struggle within the cabinet, the compulsory clauses of the amending bill had afterwards to be withdrawn. For some years after 1870 a fierce controversy raged round the twenty-fifth clause, which enabled the local authorities to pay the fees of needy children at denominational schools. This clause was thought by the nonconformists to give an unfair advantage to the church schools in places where board schools did not exist, and especially in the rural districts. It was seriously maintained that Forster, instead of founding a national system of education, had really hindered its establishment. “Forster, William Edward.” Dictionary of National Biography. Eds. Leslie Stephen and Sidney Lee. 63 vols. London: Smith, Elder: 1885-1900. Internet Archive/Online Books Page (U. of Pennsylvania). Web. 20 June 2011. "List of public art in Westminster." Wikipedia. Web. 3 October 2011.